Arizona Cardinals’ Cornerback Patrick Peterson blitzed four local Title I elementary schools with ‘Patrick’s Corners’ yesterday morning. ‘Patrick’s Corner,’ a community outreach program of the Patrick Peterson Foundation for Success, is a reading room furnished with bookshelves, beanbag chairs, a reading module and a stereo listening center and audio library that provides access to age appropriate books to serve as a dedicated area where students and their families can read, learn and explore together. 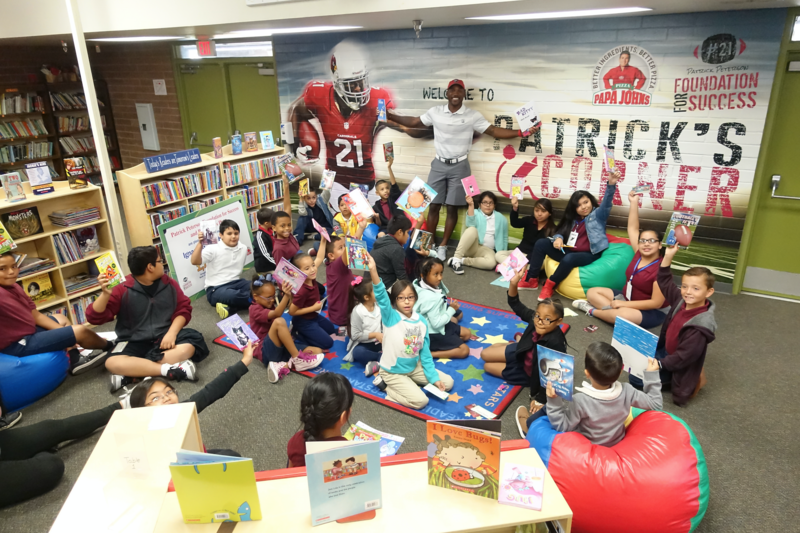 The Patrick Peterson Foundation for Success also sponsored its ‘Pick Out a Book’ Book Fair and provided each student with a reading certificate to select a new book from among 4,000 titles to take home to help build home libraries and foster a lifelong love for reading. Peterson personally introduced one of his ‘Patrick’s Corners’ and ‘Pick Out a Book’ Book Fairs, sponsored by Papa John’s, at a press conference and ribbon-cutting ceremony at Ignacio Conchos Elementary School. Following the reveal, Peterson visited with students. The cornerback videoed in to Percy Julian, Vista College Preparatory and William C. Jack Elementary Schools, while their sponsors, Western Window Systems, Ace Asphalt and the Sundt Foundation and National Bank of Arizona, respectively, cut the ribbons. The Patrick Peterson Foundation for Success has now installed eleven ‘Patrick’s Corners’ throughout the Phoenix area. Just the night before, Peterson welcomed 250 guests to the Omni Scottsdale Resort and Spa at Montelucia for his third annual Celebs and Steaks, raising $270,000 to benefit his Foundation for Success. 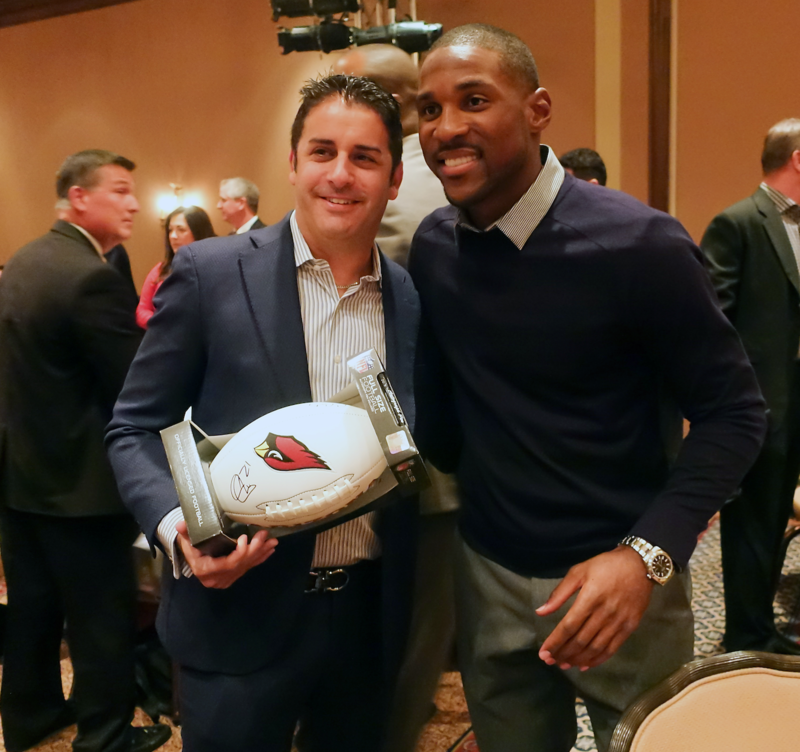 Calais Campbell, Chandler Catanzaro and Larry Fitzgerald joined Peterson and guests for a cocktail reception and dinner to benefit the cause. Jody Oehler of Fox Sports 910 Phoenix served as the evening’s emcee, while Brian Baumhor of Pacific Coast Auctioneer served as auctioneer during exciting live and silent auctions. The foundation aims to provide low-income and inner city youth with opportunities and resources to reach their full potential. Proceeds from the evening will help fund signature community outreach programs like Patrick’s Corner.